An international body that monitors displaced people says about 100,000 Arabs have been forced from their homes by returning Kurds in northern Iraq. The Global IDP Project estimates that about 30,000 Kurds who were evicted under Saddam Hussein have gone back to their home towns and villages. The Arab families have been pushed out, or fled, the group says. Many are camped in abandoned public buildings in non-Kurdish areas and are dependent on food aid. The latest report from the Global IDP Project details the consequences of what it calls the "revolving door effect", triggered by last year's war in Iraq. Suddenly the hundreds of thousands of Kurds driven out of their homes in northern Iraq in the 1980s were free to go home. The Kurdish authorities have encouraged them to return, and offered assistance while they resettle. This report estimates that 30,000 have already gone back to their home towns and villages. 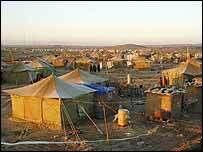 But Arab families from further south had been brought in by Saddam Hussein to occupy the villages in their place. Now those Arabs have been pushed out, or have left because they fear revenge attacks. About 100,000 have moved to non-Kurdish areas since the war. Most are completely dependent on rations from the oil-for-food programme, and some now face being evicted from their temporary shelters to make way for the new Iraqi administration. The report says political tensions are particularly high in the oil-rich area round Kirkuk. Arab and Turkmen residents are afraid the Kurdish authorities are trying to lure more Kurds to resettle there, so that the non-Kurdish population will be outnumbered in any future referendum on the status of the city.